Double the amount of tubes is double the amount of fun? Let me answer that question right away: yes, with these PrimaLuna amps, this really is the case. But with a very small caveat. Read on to find out. 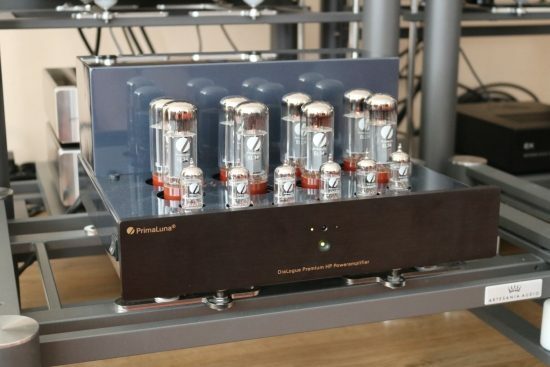 The subjects of this review are two 8-tube PrimaLuna Dialogue Premium PL power amps. 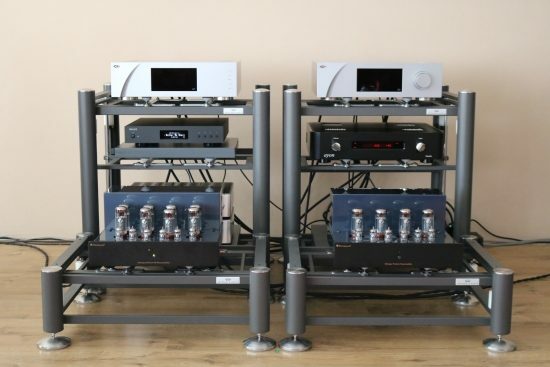 These are the High Power (hence HP) versions of the 4-tube DiaLogue Premium power amp. I have explained all the ins and outs of the DiaLogue Premium amp in the aforementioned review, so please read that first if you’d like to know more specifics about these amps. 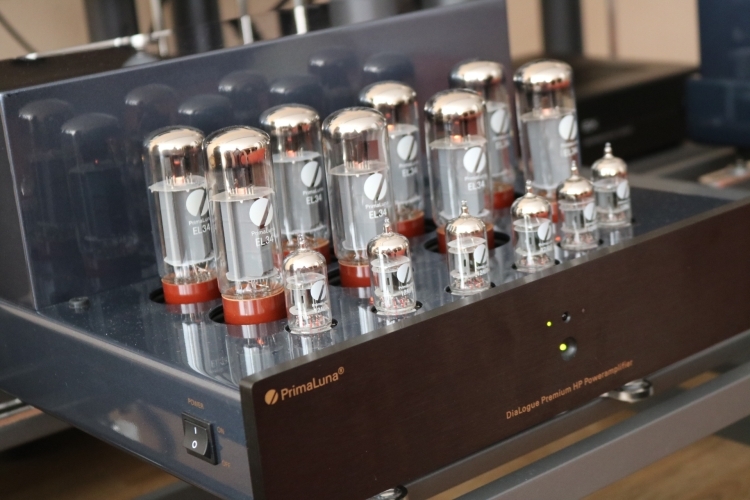 As all PrimaLuna amps can be switched between stereo and mono, this review aims not only to assess the differences between the 4-tube DiaLogue Premium and the 8-tube DiaLogue Premium HP but also between stereo and mono mode on the HP amps. 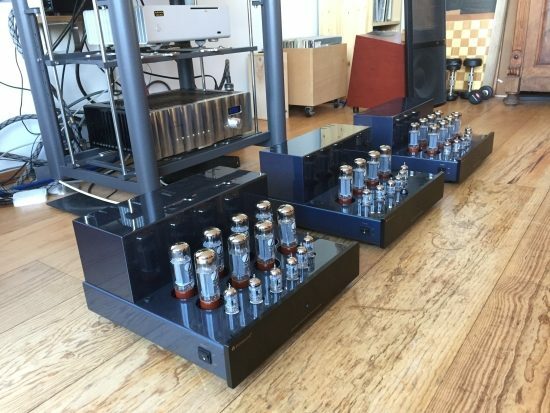 Above: the PrimaLuna amps on Artesania Aire platforms. This is how they were ultimately assessed. Initially, they were placed simply on the floor. 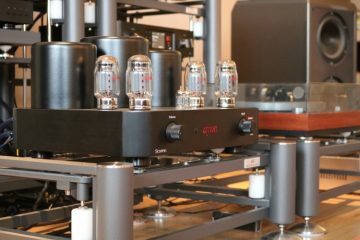 This was an interesting comparison for me personally because for some time I have been eager to confirm my suspicions that fewer output devices are better than more, be that transistors or tubes, in terms of purity and transient sharpness, and as long as the amp can drive the speakers properly. Technically speaking, using many transistors has many benefits. In my experience with transistor amps so far, however, it seems to be so that the more transistors are in the signal path, the more “overly controlled” the sound can become. Leaving aside matters of output impedance and damping factor, the result can range from an over-tight but otherwise refined sound with less of a lyrical aspect, to a sound that becomes hard or square, and, depending on amp design, even a little aggressive. I don’t think this is only a case of my subjectively preferring a “looser” sound but rather a negative aspect, taking away some purity, that is as of yet not labeled. In any event, I believe that it is best to use as many transistors as a given speaker needs, and no more. In my experience with tube amps, so far, this hardening does not seem to happen with tubes. Rather the opposite, actually. 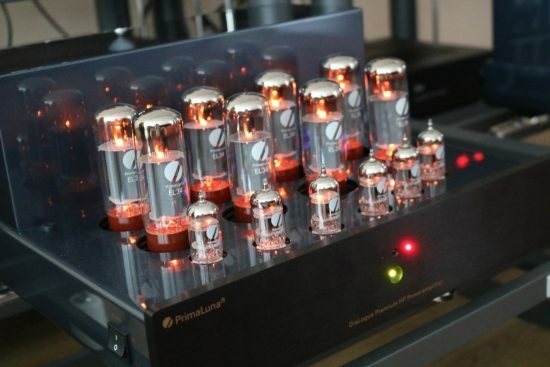 With tubes, there seems to be a blur and thickness that increase with the number of tubes that are used, which can certainly be perceived as pleasant, but also takes away from the purity of the signal, albeit in a different manner than transistors. The thing is: my observations were done with all kinds of transistor- and tube amps, so the outcome is muddied by other factors. So, what better way to investigate this correlation among tube amps than by using 3 almost identical amplifiers of the same brand? This will still not lead to a fully conclusive outcome because different manufacturers can apply different schemes that can have different outcomes, but it is a good start. 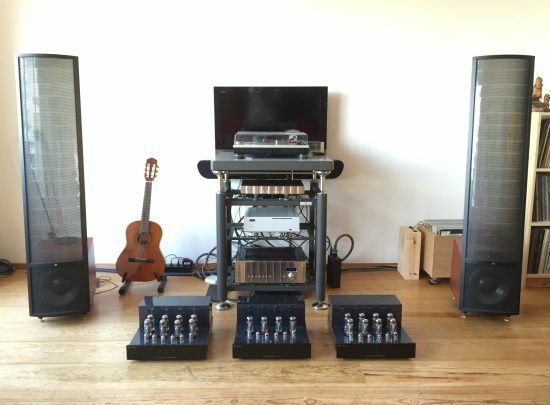 I will carry out comparisons in my own system as well as in two other, very different systems, and as such the review will provide very solid descriptions for these particular amps. Above: this is how the PrimaLuna’s were initially reviewed. The Artesania stands would follow later. I’ll start with my own system which these days is very simple and consists of a CH Precision C1 DAC/Controller, A1 amp and Wilson Watt/Puppy 8 speakers. 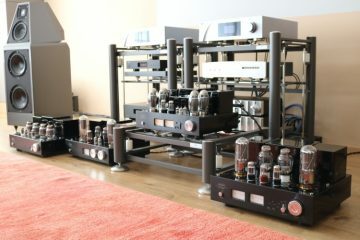 The PrimaLuna amps, in this case, are driven directly by the C1 DAC which means that there is no preamp in the traditional sense. Going from the 4-tube DiaLogue Premium to the 8-tube DiaLogue Premium HP, both with EL34 tubes, the difference was unmistakable: bigger, much bolder bass, more punch and energy and an overall more even-handed sound. Timbre-wise and resolution-wise the differences were minimal and both amps seemed to be equally wide-banded. Even the 4-tube amp already has excellent bass control using the EL34’s but this gets noticeably better with KT150’s. The 8-tube amp, however, has truly great control of even the deepest basses even with the EL34’s. With the Wilsons,, both amps have open and unrestrained treble, although the highest treble, the “air”, does become slightly darker with the 8 tube version. As the single DiaLogue Premium HP already gave the impression of having power and control to spare, I saw no need to further double up by switching the amps to mono, but this remains in store for the other systems. While it could be argued that the 4-tube DiaLogue Premium is slightly purer in sound, with this system at least, this theoretical advantage did not at all outweigh the advantages of having double the amount of tubes, especially with more complex and more demanding music. Continuing the comparisons in JW’s system, using a Jeff Rowland Synergy IIi preamp with modified BPS-2 power supply and original Apogee Duetta Signature speakers, for this review, the 4-tube PrimaLuna DiaLogue Premium replaced the ARC Ref75SE. In this context, the 4-tube DiaLogue Premium confirms the ARC’s reputation for being high-res, as the PrimaLuna does paint in broader, less defined, strokes. However, the PrimaLuna is tonally fuller and creamier, richer in the midrange, with bolder, more sonorous bass. Actually, as long as one is not fanatic about detail retrieval, nothing might appear to be amiss with the PrimaLuna and that is quite a compliment, given the large difference in price. As I understand it, ARC favors smaller transformers over bigger ones, claiming that these can be more precise. If my comparisons are anything to go by then this sounds very probable indeed. In all my comparisons so far, PrimaLuna amps always have a lot of control over the speaker, with powerful bass and saturated mids. It’s not too much a stretch of the imagination to conclude that these effects (for better or for worse) might be mostly transformer-induced. 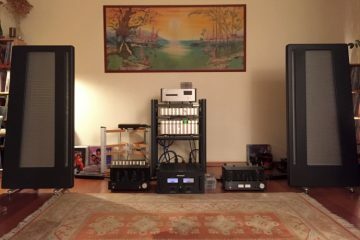 Going from the 4-tube PrimaLuna DiaLogue Premium to the 8-tube DiaLogue Premium HP, both still with EL34 tubes, the amp change worked out differently in JW’s system with the 86dB efficient Apogees than with the 92dB efficient Wilsons in my system. 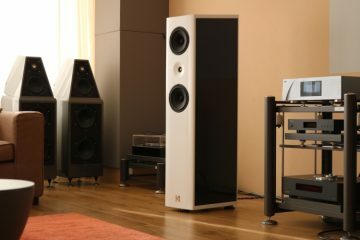 The sound did grow bolder and more punchy, but also a lot fuller in the bass and considerably creamier in the midrange. In fact, the bass was now very heavy and even a bit on the fat side and the midrange was pretty warm. Alas, in the context of this system (more power-hungry speakers), the 8-tube amp with EL34’s is not as articulate and transparent as the 4-tube amp with EL34’s. These days, I favor a cleaner, more transparent sound, but still, this is a very rich and seductive sound, and possibly precisely what many tube aficionados may be looking for. This was the cue to use two HP amps in bridged mode. Going from the single 8-tube DiaLogue Premium HP amp to using two of them in mono mode, one of each powering a single Apogee Duetta, the amps switched on silently again and still produced no noise or hum whatsoever. Configured this way, all 8 tubes are switched in parallel and both output transformers are used, halving the output impedance in the process. This was definitely a different sound: the bass was tighter and faster and more controlled and the midrange was more neutral than when using a single HP amp. Treble, however, remained a little dark. While impact and linearity were both very good, even reminding of the directness of the 4-tube amp, definition and low-level detail both stepped back a notch. This is most evident (inasmuch as my suspicion can count as evidence) in the perceived transient sharpness and dynamic swing, both of which were reduced, compared to the 4-tube DiaLogue Premium, and the single 8-tube DiaLogue Premium HP. If transformers are indeed responsible for a large chunk of a tube amp’s sound, then this makes sense, as we are now hearing two output transformers per speaker. However, what I am hearing might also indicate an increase in smear as a result of switching many tubes in parallel, which would logically lead to a less crystal-clear image than would a simpler 2-tube push-pull amp, let alone a single SET amp. This is nothing serious, though, and in line with a few other tube amps that I used, just not Audio Research, and, so far, also not the Prima Luna amps. Then again, using just one or two tubes severely limits the choice of speakers that can be used. So, as you see, it’s all relative, even more so if you consider that Apogees need a fair amount of current to sound their best. While still in JW’s system, it was now time to swap all 16 EL34’s for KT150’s. Conform earlier experiences with the 4-tube DiaLogue Premium, the sound became more neutral, with even better bass heft and control. Also as with the 4-tube amp, the KT150’s were less romantic than the EL34’s. So far the similarities. Where the outcome really differs, is in the dynamic behavior. 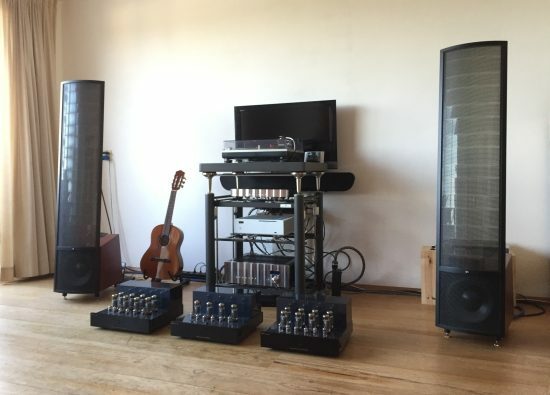 While with the 4-tube amp the sound becomes more dynamic and has more impact with KT150’s than with EL34’s, the 8-tube HP amps sound more flattened dynamically with KT150’s than they do with EL34’s. I double checked, and the same happens when the HP amp is used in stereo mode. Thanks to these amps’ beefy power supply and output transformers, the 8 EL34’s already provided plenty of slam and power. Given this result, I’d say that for the HP amp, there is no benefit in upgrading to KT150’s, unless you absolutely must have the tightest possible bass. In the earlier 4-tube DiaLogue Premium review, I indicated that I mostly prefer the Ultralinear mode with this amp. 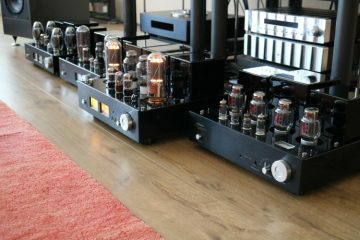 My preference with the 8-tube DiaLogue Premium HP amp, however, is the reverse. This amp has so much drive and power and already sounds very linear in Triode mode and the Ultralinear mode only serves to further tighten the sound, but it becomes free-flowing and less lyrical in the process. Even with the relatively power-hungry Duettas, Triode mode was consistently preferred over UltraLinear mode, for its more lyrical presentation while not introducing any severe losses in transparency. This contrasts starkly with the reverse situation when using the Wilsons, where Triode mode does indeed provide warmer, more richly textured mids but clearly is less forceful and articulate in the bass and rolled off in the treble. Clearly, the importance of amp-speaker pairing is not to be underestimated! Listening to the amps in this third setup lead to different results yet again, although there were also similarities. As I noticed earlier on, most tube amps sound dark in the treble and thick in the bass, when driving Martin Logan electrostatics, and the 4-tube Prima Luna DiaLogue Premium amp is no exception. Martin Logans are electrostatic speakers with an impedance curve that drops to near zero values all the way up in the treble range. Transistor amps are not at all bothered by this, as there is hardly any current running at those frequencies. Tube amps, however, have it more difficult with such loads, effectively translating the impedance curve into a frequency curve. In all my efforts using tube amps so far, Martin Logans sound a lot darker than they do with any transistor amp, and I tried tube amps of various brands, including PrimaLuna. Although the PrimaLuna certainly had the best bass and most expressive midrange of all the tube amps that I tried, it, too produced a rolled-down treble. Note that the treble is not cut off, but sloped down. But that was with the 4-tube, DiaLogue Premium and the Impression 11A and Renaissance 15A. 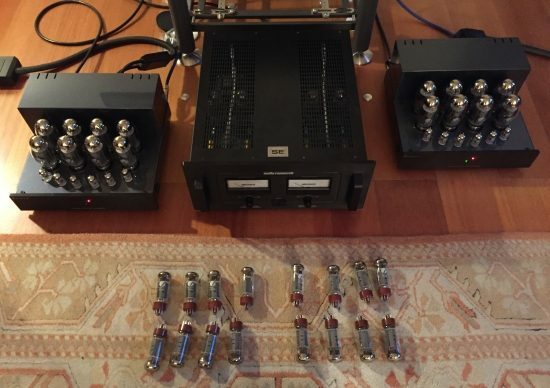 Now I have not one, but two DiaLogue Premium HP amps at hand, so I was excited to see if the situation would be changed by A: doubling up tubes and B: halving output impedance by bridging the amps. Note that bridging can be done in two ways: in series or in parallel. The former leads to a higher output impedance, which would only make matters worse with Martin Logans. The latter, however, halves the impedance which should be exactly what the Logans like. These Martin Logan Spires are not the latest models, but still quite recent. Just to double-confirm my earlier findings attained using newer Martin Logan models, we started with the 4-tube DiaLogue Premium using EL34 tubes. Coming from a Jeff Rowland Concentra II amp and now using its pre-outs, the PrimaLuna amp sounded richly colorful and very sonorous and ballsy in a way that the Rowland didn’t. As expected, the latter is more refined and transparent, but with the Logans, this is not a dealbreaker because with the speakers, somehow, the sound always retains an amount of finesse and fluidity. The overly dark tonal balance, however, is a dealbreaker. But that is also expected. Upping the game with the 8-tube DiaLogue Premium HP, we were pleasantly surprised to find that not only was the treble more open, the midrange was also more communicative and the bass further improved, retaining all the power but becoming more solid. Speed was neither slow nor fast but simply spot on. This was a promising start! Going from a single DiaLogue Premium in stereo mode to two amps in mono bridged mode, the sound opened up further, all the way to sounding really very linear, not only in the treble but the bass also seemed to become more linear. Using these two amps, the sound was fast, tight and punchy, but at the same time relaxed and smooth, and nicely free-flowing, just the way that I like it. Interestingly, unlike with the Apogees, with the Logans, these advantages do not seem to come at the expense of articulation, transient snap or overall sense of detail. In this combination, I’d say that the sound is actually only marginally less pure than with the single 4-tube DiaLogue Premium. Oh, we did experiment with Triode versus Ultralinear mode again, but just as in JW’s system, here again, we all preferred Triode mode. Swapping the 16 EL34’s for KT150’s once again was not a unified success. The bass does gain a solid state-like substance and the entire presentation becomes more neutral. Probably because there is hardly any current running, the sense of reduced dynamics was less pronounced with the Logans than with the Apogees, but still the EL34’s provide a heightened sense of fluidity and flow, and in spite of lower power, they were perceived as sounding more propulsive and more dynamic. 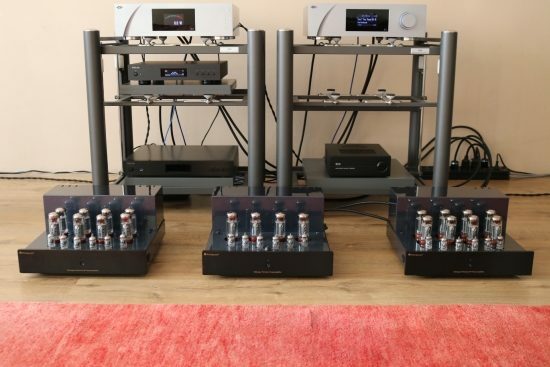 This is likely not a combination that many people will make, as these platforms cost nearly as much as the amps, but the difference in sound really is not subtle! 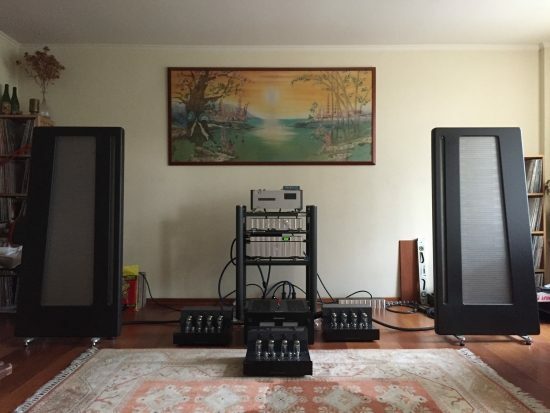 Compared to the amps sitting directly on the floor, when set up on an Artesania Aire platform and fed from the Ayon Stealth preamp, the PrimaLuna amps gain a measure of majesticness and become more fluid and a lot more refined! And, importantly, this does not come at the expense of bass power or sense of dynamics. 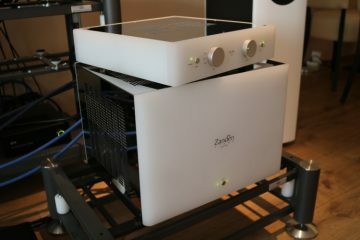 Ok, the platform does not make an Audio Research or CH Precision out of the PrimaLuna amps, but the PrimaLunas never sounded this fluid and the refinement and perceived resolution also stepped up several notches too. This just goes to show that there is a lot of potential and the importance of equipment support should not be underestimated. In the case of these PrimaLunas, big transformers mean great bass control and lots of slam, but this does seem to come at the expense of some refinement. The Audio Research Ref75SE, with its smaller transformers, on the other hand, has an excellent low-level resolution but not nearly the fullness of sound, the dynamic reserves or the amount of slam that even the smaller PrimaLuna DiaLogue Premium amp has, let alone the HP version. Interestingly, using 4 KT-150’s in the DiaLogue Premium works very well, making the amp sound bolder and more powerful but using 8 of them in the DiaLogue Premium HP, seems not to incur the same benefits. Rather, in my opinion, the KT150’s decrease some of the amp’s most appealing aspects. For the HP amps, indeed, I would stick with EL34’s, or perhaps try some of the countless other variants that can be fitted in these amps. In the intro, I indicated that I suspected that it is best to use not too many output devices. During these tests, it became clear that this is very relative. While 2 tubes per channel do sound purer than 4, depending on the speakers, the difference is not huge, and the advantages, on the other hand, can be quite large. 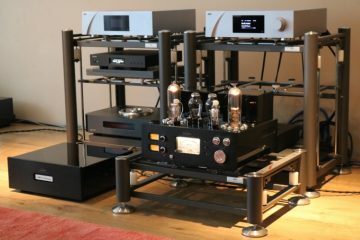 While 4050 euro is not small change, it is a far cry from the elevated prices that seem to be becoming the norm for high-end audio equipment. With less efficient speakers, using two DiaLogue Premium HP amps really elevates the sound quality considerably compared to using a single amp. 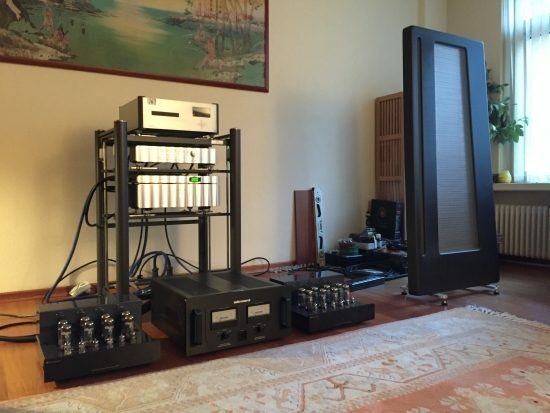 The beauty is that there is no need to spring for two amps at once. If two of these amps are not within the budget, then their stereo/mono switch makes it easy to take a staggered approach: just get one first and enjoy it in stereo mode. Then, when the craving gets too bad and when funds allow, add a second unit and switch them to mono. Great write up Christian, compliments! I fully recognize your finding, even regarding EL34 tubing and using triode mode. (I use a dialogue integrated HP). From what I can deduct from PrimaLuna images and literature, it looks like the power amp section of their integrated amps is very, very similar to that of their power amps and I assume that they’re very close in SQ. 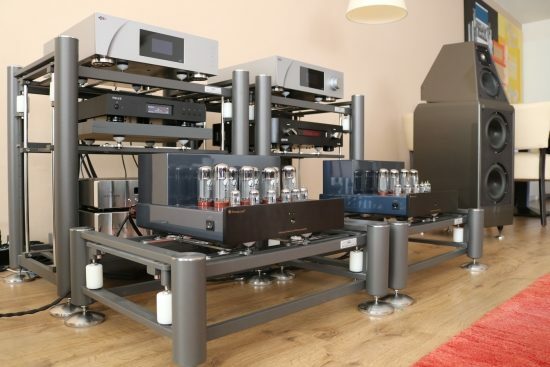 Yes, it’s driven by taste and music type but also note that tubes react very strongly to the speaker load. EL34’s are not traditionally very powerful tubes, but in the PrimaLuna implementation, they are actually powerful enough to drive the fast majority of speakers that I tried very well, and they are very affordable, which is great come swapping time. When used at their limits, though, more powerful tubes may work better. KT150’s do sound more potent but also deduct some of the EL34’s magic. I may try KT88’s, 90’s and 120’s sometime, just to get the complete picture, and, hopefully, the best balance between seductiveness and power. Ultimately though, always just trust your ears. Allright – I’ll put KT77’s on the to do list too! 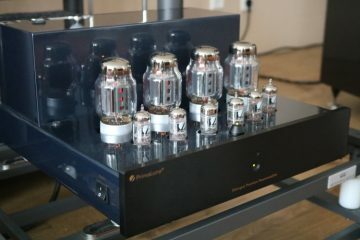 With a pair of high efficiency speakers, would you say the 4 tubes amp beats the 8 tubes amp in terms of sound quality regardless of triode or UL mode being used? 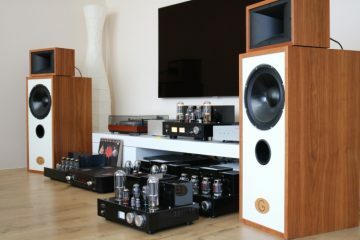 Hi Allan, indeed, if purity is the main priority then the fewer output devices you employ (tubes or transistors), the better, certainly for high efficiency speakers. In case of the PrimaLuna I also find this to be true. 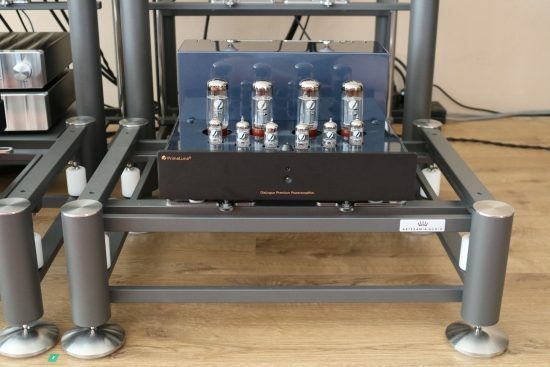 I do find that Triode is to be prefered to UltraLinear with the 8-tube HP amps, while the 4-tube amp sounds good with both modes, it being a matter of taste. If you really want to see what the PrimaLunas can do, run Gold Lion reissue KT-77 power tubes. They retain the midrange magic of the EL-34, but add a beautiful sparkle to the treble, and tighten even further the bass. Many members of the PrimaLuna Owners Group on Facebook use this combined with their choice of two vintage 12AU7 signal tubes (for me it’s nos 1950s RCA Blackplates) to great effects! Thanks for the suggestion. I certainly plan on exploring more tube combinations with the DiaLogue Premium. I had KT88’s in mind to try first and will add KT77’s to the list. Is that treble sparkle a KT77 trait, or is it particular to the Gold Lions? Excellent review and totally agreed upon. With very efficient Audio Note AN-e speakers, I found the HP power amp (together with the separate Dialogue pre-amp) to be way better than the non-HP power amp. EL-34 overall more balanced than KT-120. All Tungsol new production power tubes.